EA has apologised for mistakenly censoring mention of Colin Kaepernick from a track on the Madden 19 soundtrack. The former quarterback’s name appears in the song Big Bank by rapper YG, featured in the Madden 19 soundtrack. Kaepernick doesn’t appear as a player in the game, as EA never acquired the rights, but it appears someone on staff took this to mean all reference to the quarterback was to be scrubbed from the game. "We made an unfortunate mistake with our Madden NFL soundtrack," said EA, in a statement issued yesterday to ESPN. "Members of our team misunderstood the fact that while we don't have rights to include Colin Kaepernick in the game, this doesn't affect soundtracks. “We messed up, and the edit should never have happened. We will make it right, with an update to Madden NFL 19 on August 6 that will include the reference again. ”We meant no disrespect, and we apologize to Colin, to YG and Big Sean, to the NFL, to all of their fans and our players for this mistake." The statement followed performer Big Sean, who guests on the track and performs the edited line, calling out the publisher for blanking out Kaepernick’s name. The censorship is made more notable by the conversation surrounding Kaepernick, who attracted criticism and NFL blacklisting over his protesting of police violence and racial profiling back in 2016. 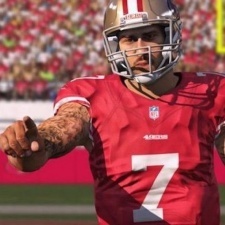 Kaepernick appeared in last year’s edition of Madden as a free agent, mirroring his real-life departure from the San Francisco 49ers in 2017, but is notably absent from Madden 19.